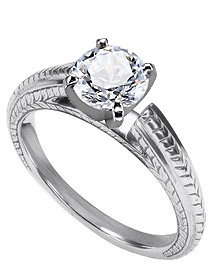 This 18k white gold engraved cathedral style engagement ring has elongatedshoulders that rise to meet its center diamond. There is a classic wheat pattern on three sides of the ring. You choose the center diamond from Danforth's inventory.